James Plattes is an accomplished jazz and classical violinist & multi-instrumentalist who is equally comfortable playing Bluegrass music and even Irish fiddle tunes. In his capacity as leader of "The Larkspur Strings", he performs with and directs a jazz ensemble and a string quartet. 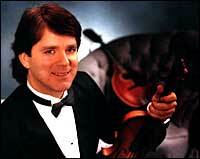 Jim began his violin studies at the age of eight and has studied with Richard Adams, Vassar Clements and Eddie Berger. He has performed at the Guthrie Theatre, The Children's Theatre Company, the Ordway Theatre and the Old Log Theatre. He has toured with Olivia Newton-John and been a member of The Daisy Dillman Band. He currently teaches violin, harmonica and mandolin at The West Bank School of Music and The Homestead Pickin' Parlor. He is also CEO of Violinagram.com. Jim has released four albums: "The Gypsy Fiddle Player/Amorica" (1980) "First Ray of Sunlight" (1997) "In the Moment" (2005) and "French Musettes & Love Songs" (2012). Winner 1989 West Bank School of Music “Jazz Composer Series” competition. Winner, Intermedia Arts Sound Images showcase competition (Amazonian Dreamscapes) 1990. Minnesota Music Academy Award recipient 1988.